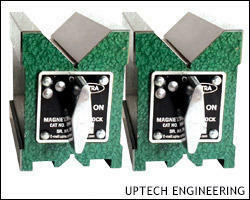 “Uptech Engineering” is a smart firm that is engaged in manufacturing and offering the clients with Magnetic V Blocks that are capable for Holding The product for Grinding or Inspection Operation. Our exclusive range of V Blocks like Ultra Hardened Magnetic V Blocks, Leak proof Magnetic V Blocks, Magnetic V Block, Ultra Roller Bearing V Blocks, Roller Bearing V Block, B(Ball) Blocks With Clamp are made using high grade raw material and latest technologies. 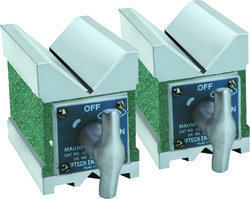 We are dealing in Magnetic V Blocks - . Below are the mentioned features of the product. We are dealing with Ultra Brand Leak Proof Magnetic V Blocks. Below are the mentioned specifications of the product. Three magnetic surfaces Top, Bottom & V faces. 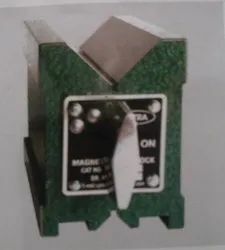 Magnetic V Blocks offered to come with all sides hardened & ground and find application in handling the needs of light milling, grinding, drilling as well as inspection of a round as well as square jobs. 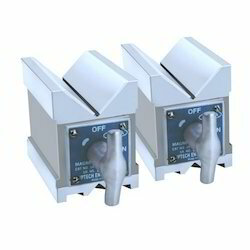 Further, these are supplied in the matched pair and come with uniform as well as strong magnetic pull to all three magnetic surfaces including top, bottom and V faces.